On a recent Sunday, California Girl and I went to Cornerstone Gardens and Market in Sonoma. 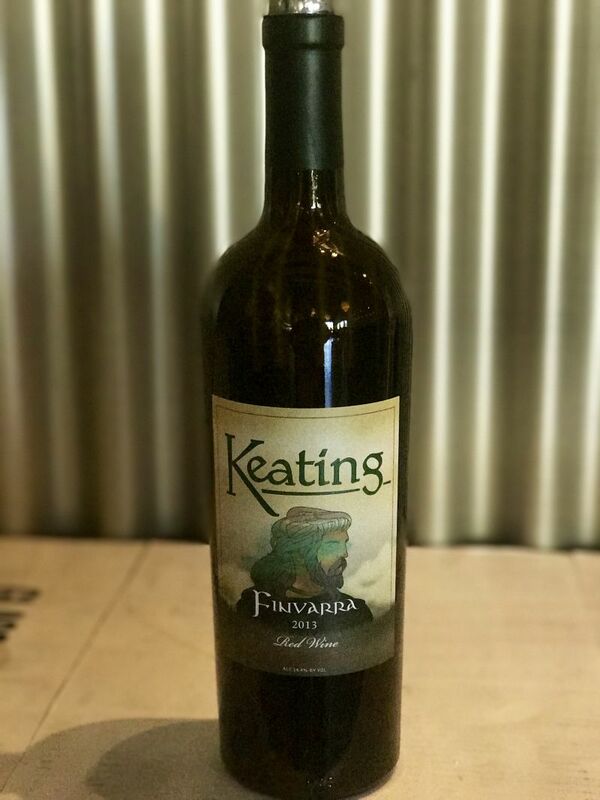 Whilst there, we visited Keating Wines to taste from their current releases. 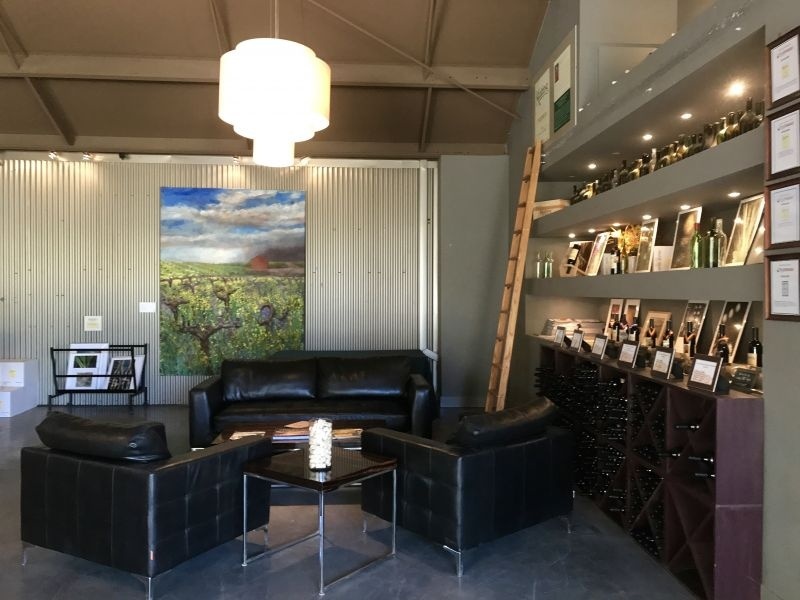 The tasting room is in a nondescript building in the Cornerstone complex, but the interior, whilst simple, is attractively decorated. The far wall from the entrance is dominated by a large painting of vines. A bar runs along the left-hand wall, with bottles of wine and other items for sale across from the bar. For those who do not wish to taste at the bar, there are some comfortable leather chairs and sofas in the middle of the room. We were greeted by Carlo, who was our host for the session. 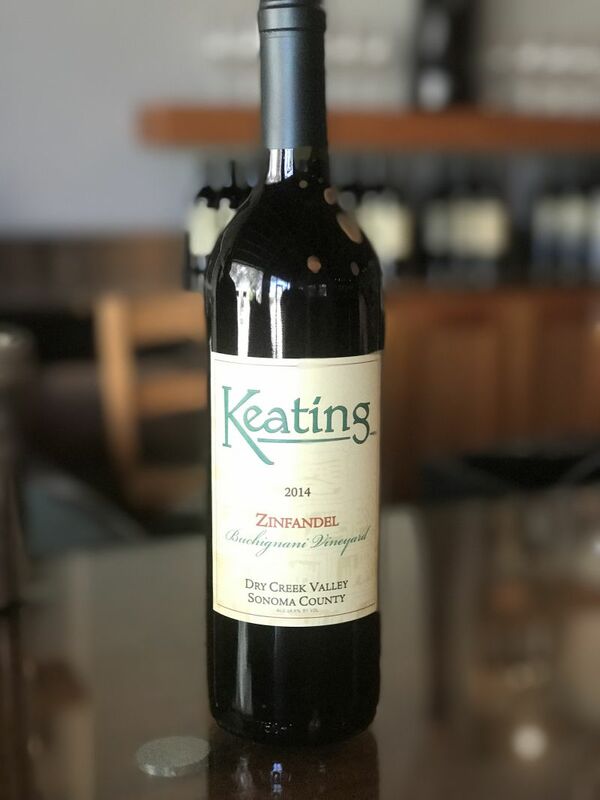 He explained that Keating Wines owned no vineyards, but sourced grapes from the vineyards that Eric Keating considered to be the best. Most of these vineyards are in Sonoma County, but they do make a Cabernet Sauvignon from Beckstoffer’s George III vineyard in Napa Valley. Eric Keating hails from Santa Rosa in Sonoma County, pursued a finance career on Wall Street and then returned to California. He learned about the art of making wine at a vineyard in Kenwood, before starting his own label. 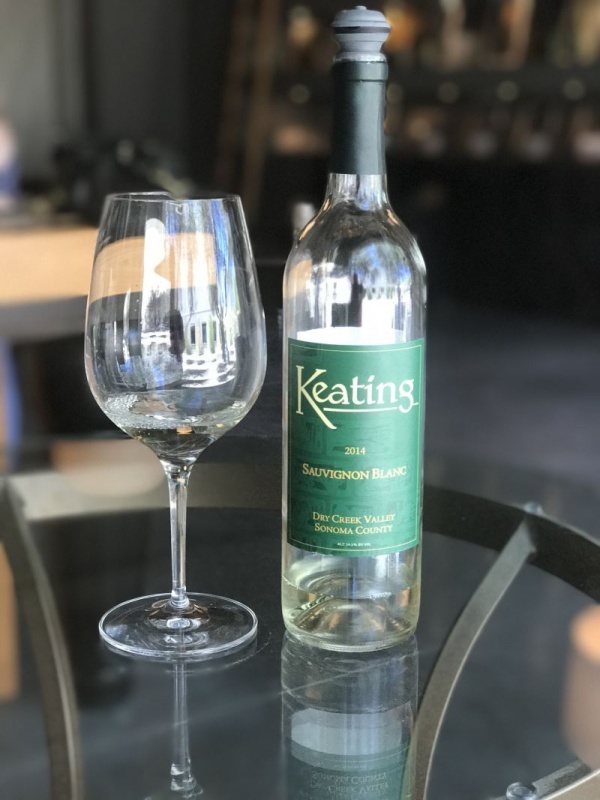 The total production of Keating wines is around thirteen-hundred cases a year. We started with the Sauvignon Blanc, with grapes sourced from Dry Creek Valley. 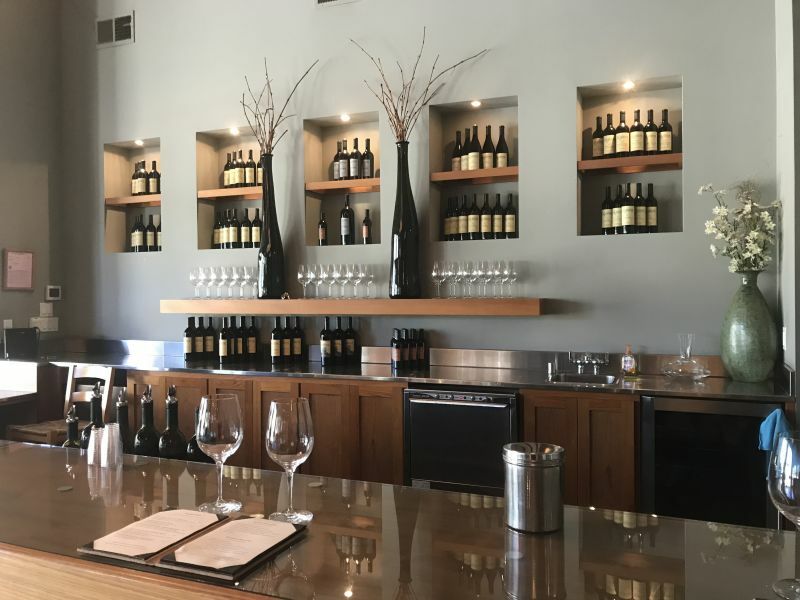 This AVA in Sonoma County has over twenty-five wineries making the varietal. The colour was a pale shade of lemon. Its nose was free of the mown grass odour so often found with Sauvignon Blanc; instead, I found honey and nuts. The wine was crisp, with a light flavour combining citrus and kiwi into a long finish. This wine was easy to drink and priced at $25 a bottle. The next wine was the 2014 Zinfandel ($35) from Montecillo in the Moon Mountain District AVA, one of Sonoma’s newest, becoming an Appellation in 2013. The fruit from this high elevation made a delightful wine. The colour was a clear, rich ruby. An intense nose of cherry greeted me well before I had my nose in the glass. Taking a sip I encountered medium plus acidity with flavours of plum and leather. This Zinfandel was reminiscent of a European wine rather than the fruit bomb Zinfandel oft associated with California. The Sauvignon Blanc had been fine, but this wine was striking in its well-balanced complexity. The third wine we tasted was the 2014 Rockpile Malbec ($42). In addition to the eponymous grape, there is 15% of Cabernet Sauvignon added. The wine spent twenty-two months in French oak, with half of it in new casks. 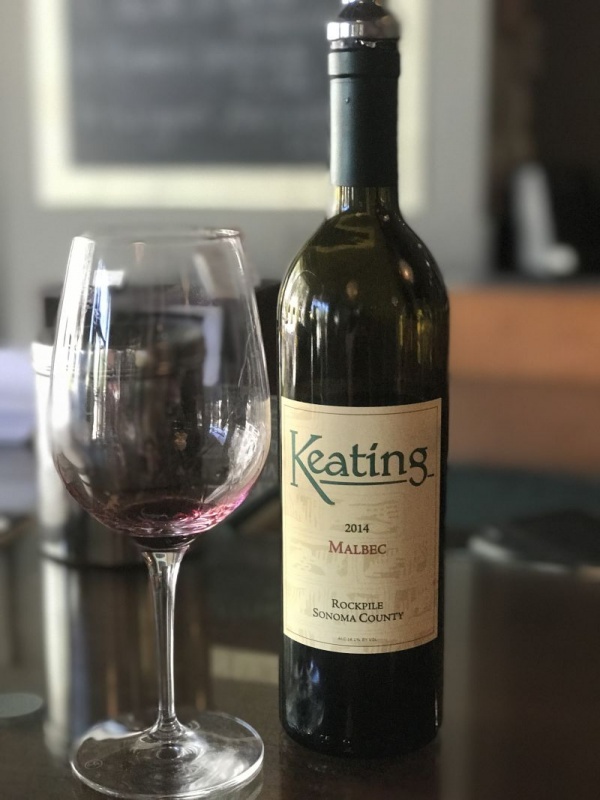 Malbec was the first wine that Eric Keating released and received a warm critical reception. In the glass, I saw an imperial purple colour. Once more I was greeted with an intense nose, this time of plum and wood. It was a nose that held my attention, I inhaled deeply, delaying the moment that I first sipped the wine. Finally, I took a taste and was rewarded with a silky smooth mouthfeel wrapped around slightly sweet fruit. The finish discarded that sweetness to create a dry blend of fruit and tannins. There was none of the spice that is so characteristic of Malbec from Argentina. A very good wine that can be enjoyed immediately. The fourth wine on the list was the 2013 Cabernet Sauvignon, which as with the Zin was from the Montecillo vineyard. The vines are fifty-six years old, an unusually great age for Cabernet vines. The nose was less intense than with the previous two red wines; combining cherry and bloody red meat. Taking a sip the fruit notes of blackberry played second fiddle to assertive tannins and acidity. This is not a Cabernet to take home and drink tonight. This is a wine that needs time in a cellar, it is set up to age well. There was a clear reminder that we were tasting in Sonoma and not Napa, as the wine was priced at $48. The fifth wine was a Bordeaux style blend, the 2013 Finvarra. The distinctive label is from artwork by Eric Keating’s fourteen-year-old niece. Its name refers to a figure in Irish folklore associated with good harvests. This wine is a blend of 67% Cabernet Sauvignon, 16% Petite Verdot, 15% Merlot, and 2% Malbec. Its origin is described as North Coast, reflecting fruit sourced from Napa and Sonoma. The cellaring potential of this wine is described as 2018-2027. I would suggest keeping it well past that lower bound. The nose was of medium intensity, but delightfully lush. Taking a sip I was struck with a high acidity and forthright tannins backed by dark fruit. This is not a wine to drink now, there is too much promise of a better future. It sells for $55. Carlo had an open bottle that was not on the list; a 2011 Petite Sirah. This was a library wine that had been opened for wine club members who had dropped in earlier. The nose was an intense blast of plum. The wine was a deep, dark purple shade. Taking a sip I was struck by the tannins which morphed into more than mouth dryness by exhibiting black tea flavours, well integrated with a long finish of fruit and a hint of cocoa. From a notably tricky vintage, this was a wine with real panache. The tasting wrapped up with the 2014 Port style Zinfandel. This sells at $25 for a 375ml bottle. Fermentation was arrested by the addition of their own Brandy, which results in a wine that is 17.4% ABV and 2% residual sugar. The nose was of hazelnut. Tasting I was impressed by the smoothness and excellent balance between sweetness and fruit. It was noticeably less sweet than many other wines of this style. 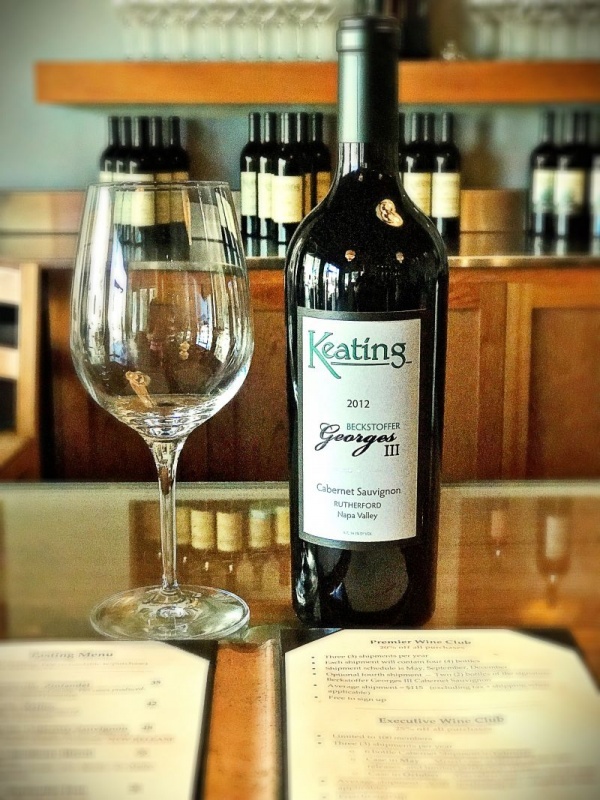 The tasting fee at Keating Wines is $15, well below the going rate in Napa Valley. The list offered a mix of wines drinkable now and those that should be put away in the cellar. Our host, Carlo, rounded out the experience with his enthusiasm, knowledge, and attention to all of the parties that were there.